Waterjet Cutting Machines are fast, efficient and versatile machines and a great addition to any manufacturing operation. They require very little maintenance and shopping for replacement waterjet parts online is an easy process. In general, most of the parts you will need for upkeep of your waterjet machine will be pretty consistent across brands and this allows you to shop around online and find the best prices and customer service to meet your needs. Like shopping for anything, you will want to do some comparison shopping. Most manufactures of waterjets will have a parts division and can supply with you a parts guide. Many of these waterjet production companies supply parts for not only their own brand of watrerjets, but other brands as well, so don’t feel like you have to buy parts from the same place you purchased your waterjet. Shop around a bit to fid the best deals. Make sure when you purchase replacement waterjet parts that you are matching the correct brand to the part number. There will be some variations from the different manufactures of waterjet machines and you want to make sure you get the right part. 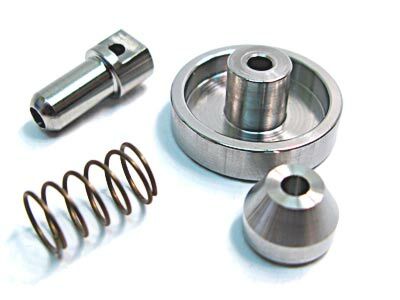 Generally speaking, it is the same parts that will require upkeep and replacement and when finding a good place to buy parts, find a company that makes this process seamless. A good website will offer the most commonly needed waterjet parts for quick online ordering. This will included abrasive nozzles, water-only and abrasive orifices, and repair/rebuild kits. While shopping online is convenient and it is nice to do most of the work yourself, it is helpful to talk to a live person sometimes. When looking for the best place to buy waterjet parts online, it’s important that you also have easy-access to a customer service representative. Make sure the company you select has a department that is accessible. There should be a 1-800 number and an e-mail to a customer service representative. This is helpful when you need help locating a specific part that is not listed on the website.